Grab a seat on our tour bus and see the Grand Canyon in luxury, comfort, and style. No check-in terminals, no waiting. Experience the Mojave Desert scenery as you travel along historic Route 66 to the Grand Canyon. Touring from Las Vegas to the Grand Canyon South Rim (National Park) is a once in a lifetime experience for most visitors. We are here to make your tour special and memorable. We have some of the best day tours of Grand Canyon National Park. Our Grand Canyon National Park South Rim bus tour will allow you to experience the preserved, natural side of the canyon with its unguarded edges and lush green forest for you to enjoy. The park was officially established in 1919 and covers almost 2,000 miles. 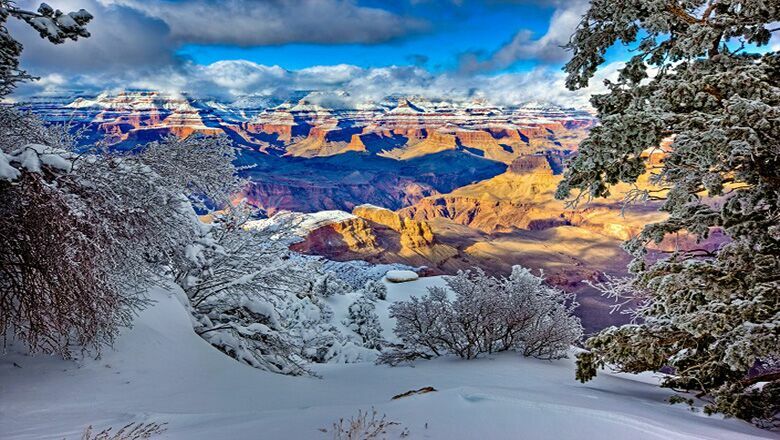 The South Rim averages 7,000 feet in height. Many tours in Grand Canyon South Rim do not offer the chance to see the multitude of outlooks offered in the Grand Canyon National Park location. 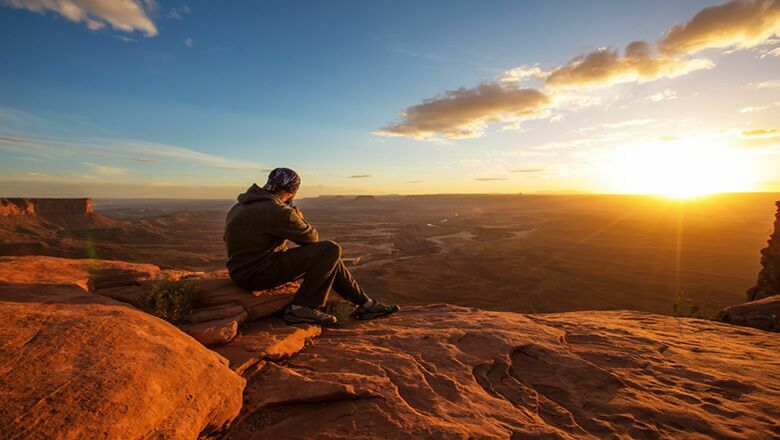 Our tour not only directs you to the most beautiful viewpoints, but also allows you ample time to enjoy them. 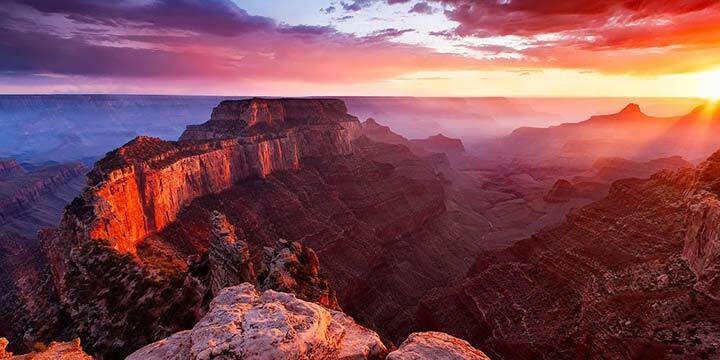 Some of the historic sites that you can see on our Grand Canyon National Park tour include Mather Point, Bright Angel Trailhead, Bright Angel Lodge, Kolb Studio, the Hopi House, El Tovar Hotel, Yavapai Geology Museum, the Grand Canyon Visitor Center, Kachina Lodge, Verkamp’s Visitor Center and much more! 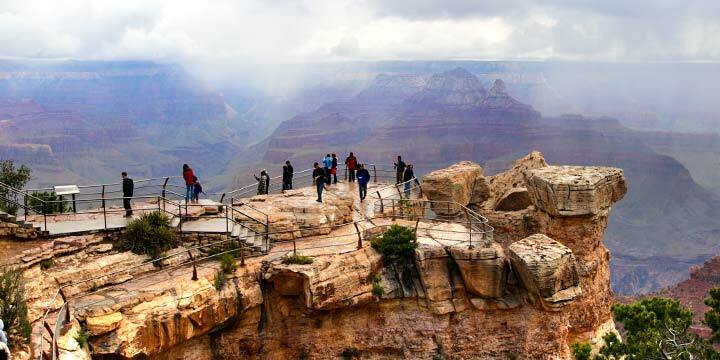 Grand Canyon South Rim tours from Las Vegas attract millions of tourists each year. If you are going to be one of those visitors, you will want to ensure that you get the best Grand Canyon tour you can so you can make the most of your trip. We have three excellent options for our Grand Canyon tour from Las Vegas to the South Rim. 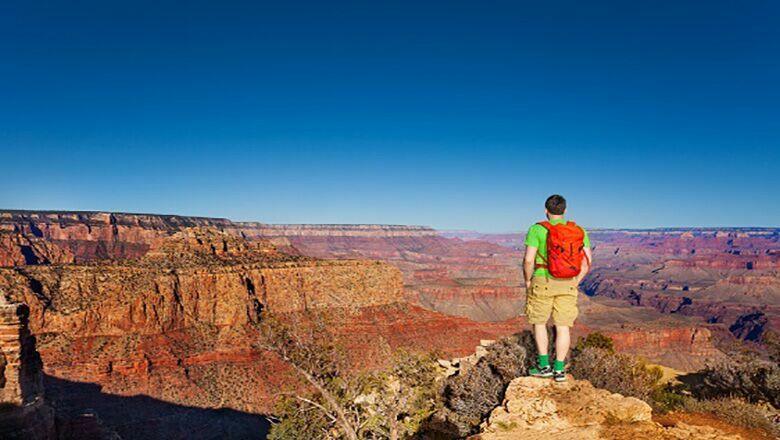 Take a luxury bus to Grand Canyon National Park and explore on your own as the first option. Choose a guided walking tour if you’d like a more insightful and educational tour with all of the most memorable photo spots. Choose a luxury small group Grand Canyon tour for the most personalized and stress free experience. No matter what kind of adventure you choose, we are proud to provide the most detailed and guest-oriented Grand Canyon tours in Las Vegas. Our Grand Canyon National Park tour from Las Vegas is one of our most popular tours for a reason. Grand Canyon National Park is located at the South Rim of the canyon which is packed full of famous viewpoints, opportunities for learning, and a picturesque Grand Canyon visitor experience. 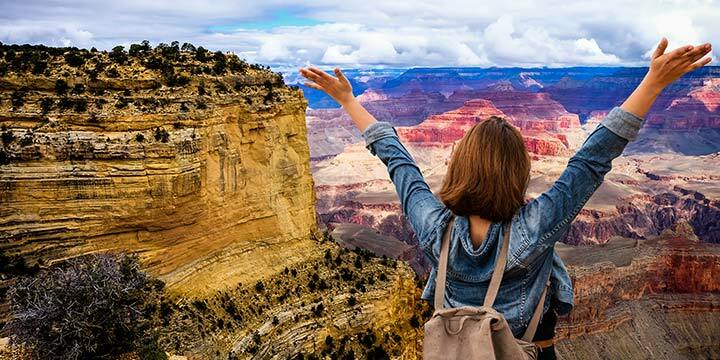 One thing that sets Grand Canyon Destinations apart from other tour companies are the various options we offer for Grand Canyon tour packages from Las Vegas. Our 3 tour packages, mentioned above, allow you to customize the perfect tour for any group, occasion, or preferred tour style you may have. If you are looking for a guest-oriented, convenient, and affordable Grand Canyon tour from Las Vegas bus experience, we highly recommend letting us at Grand Canyon Destinations handle all the details.